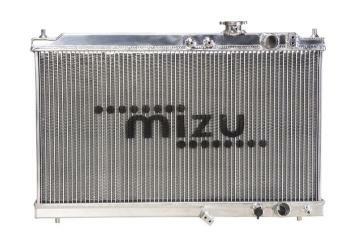 Mizu Performance Radiator - Dezod Motorsports Inc - Home of the automotive performance enthusiast since 2002. The Mizu performance aluminum radiator is the perfect upgrade to your stock radiator. Made from the highest grade of aluminum, all Mizu aluminum radiators are hand-welded and hand-made to create a perfect radiator with a direct OEM fitment without any cutting or modification needed. 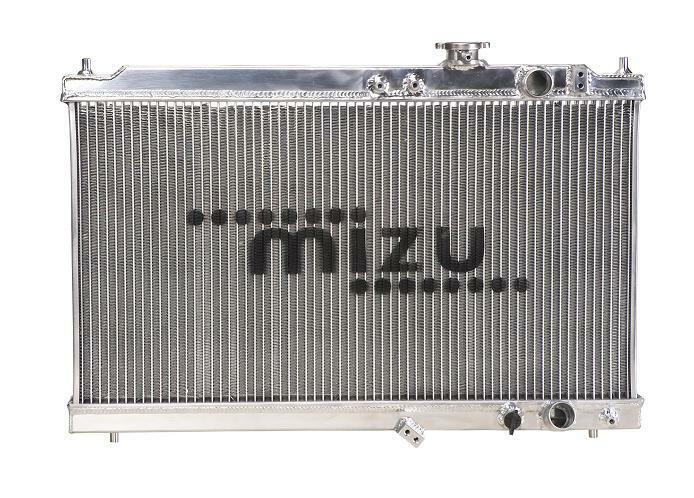 All Mizu radiators are designed and engineered to maximize cooling efficiency by increasing the radiator core’s thickness, fin density and using 3 radiator cooling rows as opposed to 1. These advancements in cooling technology will protect your car from overheating under the harshest conditions. All Mizu radiators come with a high pressure 1.3 bar Mizu radiator cap and an unparallel lifetime warranty.